Consider it wholly joyful, my brethren, whenever you are enveloped in or encounter trials of any sort or fall into various temptations. Count it all joy, my brethren, when you may fall into manifold temptations. 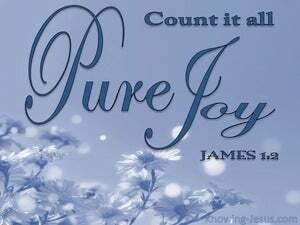 My brethren, count it all joy, when ye fall into divers temptations, Knowing that the trying of your faith worketh patience. My brethren, count it all joy when ye fall into divers temptations. Reckon it nothing but joy, my brethren, whenever you find yourselves hedged in by various trials. 1 James, a bond-servant of God and of the Lord Jesus Christ, To the twelve tribes who are dispersed abroad: Greetings. 2 Consider it all joy, my brethren, when you encounter various trials, 3 knowing that the testing of your faith produces endurance. "Blessed are you when men hate you, and ostracize you, and insult you, and scorn your name as evil, for the sake of the Son of Man. Blessed is a man who perseveres under trial; for once he has been approved, he will receive the crown of life which the Lord has promised to those who love Him. "Blessed are those who have been persecuted for the sake of righteousness, for theirs is the kingdom of heaven. So they went on their way from the presence of the Council, rejoicing that they had been considered worthy to suffer shame for His name. and if children, heirs also, heirs of God and fellow heirs with Christ, if indeed we suffer with Him so that we may also be glorified with Him. Who will separate us from the love of Christ? Will tribulation, or distress, or persecution, or famine, or nakedness, or peril, or sword? And He has said to me, "My grace is sufficient for you, for power is perfected in weakness " Most gladly, therefore, I will rather boast about my weaknesses, so that the power of Christ may dwell in me. Now I rejoice in my sufferings for your sake, and in my flesh I do my share on behalf of His body, which is the church, in filling up what is lacking in Christ's afflictions. For you showed sympathy to the prisoners and accepted joyfully the seizure of your property, knowing that you have for yourselves a better possession and a lasting one. and others experienced mockings and scourgings, yes, also chains and imprisonment. but to the degree that you share the sufferings of Christ, keep on rejoicing, so that also at the revelation of His glory you may rejoice with exultation. 'Do not fear what you are about to suffer. Behold, the devil is about to cast some of you into prison, so that you will be tested, and you will have tribulation for ten days Be faithful until death, and I will give you the crown of life. But even if I am being poured out as a drink offering upon the sacrifice and service of your faith, I rejoice and share my joy with you all.